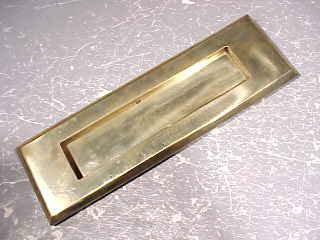 Price Is For This Wonderful Old , Heavy Cast ROSE Brass , Mail / Letter Slot [ 1 Front Piece Only ] -Appx. 10 3/16" x 3 3/16" Outer Measurements ; Appx. 7" x 1 1/2" Inside Hole Measurements - Mounts By Two Screw Bolts Into The Back - Nice Quality Brass Slot - Please Email Or Call Us For Shipping Cost, Before Submitting Payment - Purchaser Pays Shipping.